A report by the Civil Justice Council has recommended creating an online dispute resolution system for claims worth less than £25,000. It is alleged that the new system used to solve cases in England and Wales is to be modelled on that used by eBay to solve disputes. The new online system would reduce the expenses created by using a traditional court. How would the dispute resolution system work? The dispute resolution system used by eBay diagnoses and resolves disputes between parties using online facilitators to help parties reach an agreement. This system resolves around 60 million disputes between traders each year. This is the model that the new online courts system would be based on. Where the online facilitators fail to assist parties in reaching an agreement, online judges would rule on cases without requiring the parties to attend court to give evidence. Principal author of the report outlining the proposals and IT adviser to the Lord Chief Justice, Professor Richard Susskind said the eBay model was "remarkable" and could be used in a similar way in the civil courts system which at present is too costly, complex and slow. "a three-tier structure, and we expect most disputes to be resolved at the first two stages without a judge becoming involved". Tier One: This would be the dispute avoidance stage where interactive guides and information would be made available to those with a potential claim or dispute. These guides would help people understand the issues they have and the options they have for resolving their issues. Much like the guides available here at Unlock the Law. Tier Two: This is the dispute containment stage where the online facilitators would become involved. The facilitators are not judges but mediators who aim to help parties settle their dispute without the involvement of a judge. Tier Three: This is the dispute resolution stage. At this stage a judge would step in to consider the case online. The judge will make the decision largely based on documentation however telephone hearings may be conducted if necessary. Prof Susskind stated that this kind of system could resolve tens of thousands of cases every year - and at a greatly reduces cost for the parties involved and the taxpayer. 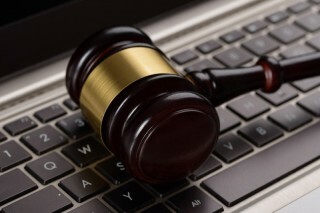 Will these online court proposals be put into practice in the UK? Lord Dyson, chairman of the Civil Justice Council, determined that the proposals had "enormous potential" and that the aim of the new system was "to broaden access to justice and resolve disputes more easily, quickly and cheaply." "Proper consultation and proper investment would be essential. There has been a long history of underinvestment in court IT in England and Wales....in 2009 Lord Justice Jackson noted that the courts still did not have an IT system which was adequate for the delivery of civil justice at proportionate cost." However, there has already been progress and commitment to investing in IT solutions for a modernised justice system. A new online system has been initiated by the Traffic Penalty Tribunal, arbitrator of disputes between motorists and councils in England and Wales. This system allows appellants to upload evidence, make an appeal and follow cases and hearings under one evidence screen and account. The report also outlines that each local authority can view current cases and submit evidence. The concept of online courts is still however in its early stages, with many practicalities left unanswered. It is an exciting concept that court professionals may be entering the digital ages and able to function in a paperless environment. It will be interesting to see whether the courts will be given IT systems of sufficiently high quality to handle as large a case load as eBay and also how quickly disputes will be resolved. For more information on the civil justice system, including alternative dispute resolution, read our legal advice guides, subscribe to our YouTube channel or follow us on Twitter.